Greater Moncton received 30.8 mm of rain yesterday which breaks the previous record of 21 mm from 1992 according to Environment Canada. As a result of the heavy rain and snowmelt, flooding has become a problem in low lying areas. Acadie Avenue in Dieppe, a provincial highway carrying more than 24,000 vehicles per day, has been virtually shut down due to flooding although efforts are being made to open at least one lane of traffic. In Riverview, Hillsborough Road at the town limits has been inundated with water after Mill Creek spilled its banks today leading to a lengthy detour for many motorists. 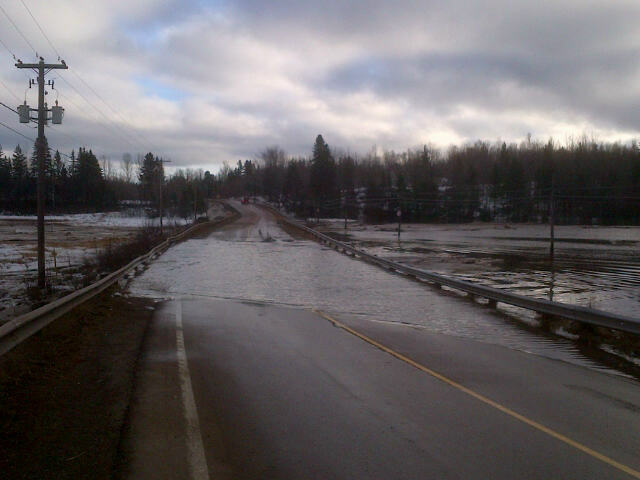 Route 106 between Memramcook and Dorchester has also been closed due to flooding this week. The forecast is calling for at least 10 mm of rain in Southeast New Brunswick tomorrow. Scattered frost was reported across Southeast New Brunswick this morning – the first of the season for many but none was found in my northeast Moncton neighborhood. Environment Canada indicated a low of 1.7°C at the Greater Moncton International Airport in Dieppe compared to the record of -1.7°C from 1948. Saint John dropped slightly below freezing at -0.1°C while Fredericton also fell to 1.7°C. Edmundston was the cold spot in the province today with a low of -2.5°C.